Hello Community members! Welcome to the new VisitScotland Community. As we now have more and more members joining, we thought we'd create a new thread with a little guidance on how to use the Community and get the most out of it. Please ask any questions you might have about the forum software in this thread and we'll do the best we can to answer them. In the meantime, here's a quick guide to the main site features. The navigation at the top of the page is specific to the Community. The Search box allows you to search the whole Community for specific things. You can search for combinations of words, or for specific phrases by putting your search term inside quotes, i.e. "Isle of Lewis"
The main way you will be able to find new threads and comments is to browse our main category listing. You will see this as soon as you enter the Community. You can select the title of the category to view that category, or jump straight to the latest post for each category on the right. unanswered questions and popular tags. A thread or discussion is where most of the interesting things in the Community happen. It's a conversation between members of the Community and you can jump right in and start commenting. You can also post three different kinds of thread - a general post, a question (which allows you to mark responses as good answers) or a poll. Just click the arrow on the New Post button to choose the kind of content you would like to post. To add a contribution to a thread, scroll to the bottom and use the comment window. This is similar to a word processor, with simple controls. You can bold, italicise or add strikethrough text. You can also add bulleted or numbered lists, add emojis and left, right or centred text. If you need more space, you can use the 'Fullscreen' button on the right of your editing window to let the editor take over your whole screen. You can also quickly preview or save a draft of your post, or just post it straight away. See below for adding files, images and links. There are two ways to add images. The simplest way is to simply drag an image from your desktop onto the comment window. The image will appear wherever your cursor was located. You will also see a small thumbnail of the image at the bottom of your post. If you want to move the image to a different position, click the 'X' next to the thumbnail, click to move your cursor to the new position, then click the thumbnail to reattach it. 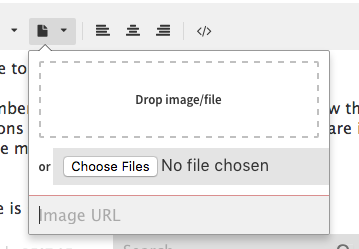 This allows you to drag a file or image, select it from your computer's file system, or link directly to an image on a hosting service such as Flickr, Imgur or 500px. Please don't link directly to images which don't belong to you. To create a link, highlight the text you would like to make into a link, then click the Link symbol in your toolbar. Type or paste the URL you would like to link to and click OK to create your link. To add a video to your post or comment, just paste in a URL from Youtube or Vimeo. It will be automatically converted into a video player. Click 'Preview' to check that your video is working before you post. Unfortunately we don't allow member's own videos to be directly uploaded to the Community as the file sizes are generally too large. But Youtube and Vimeo accounts are free to register, so feel free to share your videos of Scotland with us! To mention another user, you can use the @ symbol. Just type '@' and begin typing their username, then select the right one from the list. This will send them a notification to let them know you have mentioned them. Finally, don't forget you can upload a picture of yourself to help other member's identify you, as well as adding a signature to your posts, checking your bookmarked 'favourite' threads or just seeing what's new on the threads you've commented on. Use the menu in the top right of the screen to access your personal profile, favourites and more. Hi @VisitScotlandDave - I just signed up to share my passion for the wildlife and wild places of Scotland. This sounds like a great idea. I have a question about adding photos to comments. I can drag a photo into a comment, but when I try to post the comment I get feedback saying that I have not been a member long enough to add links. When I delete the photos from the post and resubmit, the comment is published with links to the photos even though I thought I had deleted the photos before publishing. I would prefer my photos to be shown inline if I submit them, or not at all. Is there a process to ask for ability to post inline photos and url links? To protect our community from devious spammers, we have a couple of restrictions in place. You need to be a verified member before you can post links and images, which usually takes three comments and 24 hours. I've altered your permissions to speed up the process, so if you try now, you should be able to use all of the features. Please give me a shout if you have any more difficulties. Hi, on my very first post, I have started a new discussion, but now I realise that I could have posted it as a question. Can I change it from a discussion to a question and if so, how do it do it? Hi @VisitScotlandDave could you explain a little more about badges? 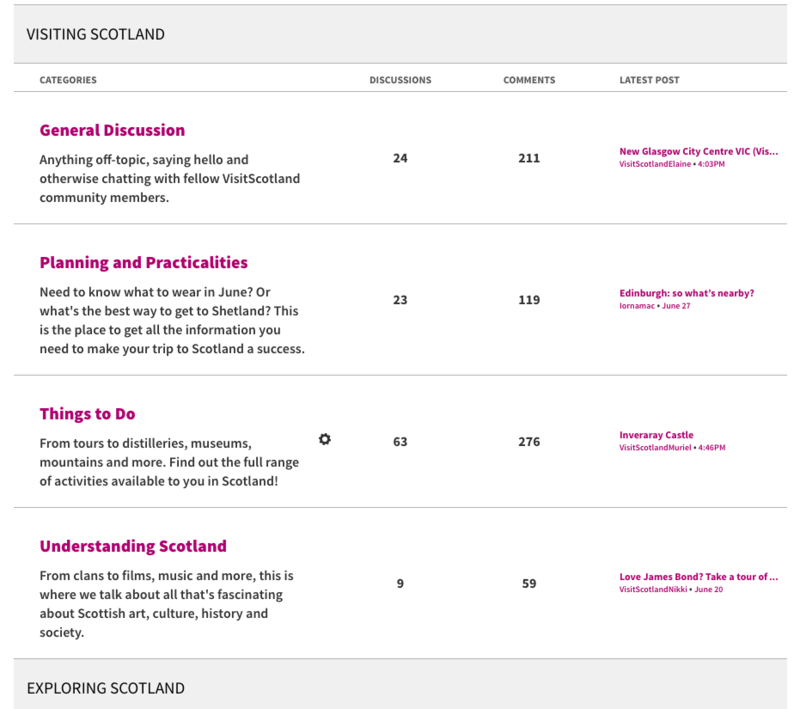 Are those that have 'Ambassador' or 'Contributor' badges and status working with Visit Scotland or are these earned through posting and interactions? @Cakegirl - there isn't a way to change the type of a discussion after it's posted I'm afraid. However, I've deleted your original post (as it didn't have any responses yet) so you can repost it as a Question discussion. @Zubenelgenubi - you can edit your comments or your posts for 15 minutes, but you can't switch them to another type, sorry! @thetinberrytravels - some of our badges are awarded automatically, usually for a certain number of points or comments (if other users like or promote your comments, you get points for it). Other badges are awarded manually by moderators, for really good comments and if you're engaging a lot with a particular topic. The Ambassador and Contributor badges are reserved for members who joined the Community during our closed Beta phase. These members helped us to start many of the discussions on the Community and have agreements with VisitScotland to engage with us and with other members. We're open to recruiting more Ambassadors and Contributors in the future - if you would like more information on this, jump on our live chat to have a talk with one of our admins. 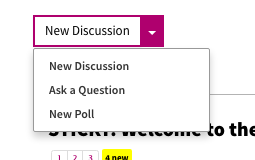 Actually @Cakegirl - I just figured out how to switch a discussion into a Q&A, I missed the option in my admin menu. That's now set up as a Q&A for you! @VisitScotlandDave - Ah ok thanks for that. That's a shame I was invited to that back at the start but only got around to joining this month. Silly Silly. It would be something I would be interested in, in the future if it comes back up now that you guys have officially launched. Thanks for the info Dave. So cool you guys have livechat attached here. how long do you have to be a member before you can post links? I think it may have happened for me after 24hrs? and after I'd made a post or two. Sorry I can't track down where it said!! @gillcmcc Found it! @VisitScotlandEsther posted above. Looks like it's 3 comments and 24 hours! Sensible precaution against spammers though I must say. Hi @gillcmcc I've checked and you're definitely a verified member now, so should be able to start threads and include images and video in your posts. Hello, I've just signed up and I'm really looking forward to being part of the community. Hi, I just signed up. Looking forward to being a part of this. Living in Denmark, but my heart belongs to Scotland, which I've visited seven times and feel more at home and ease being there, than Denmark. @Damicless I'm not 100% sure but if you go to the top of the page and click on your name which is on the purple strip that will take you into your profile page. If you click on the logo that is appearing beside your name at the moment there should be an option to change picture there. Hello @Damicless, Fofoma is right - to change your profile picture, you can go to your profile page and hover or click onto your picture. This will give you the opportunity to select the 'change picture' option. Hi everyone ~ Bruce_Boogie here, just a visitor to Scotland, but we try to drive north at least twice a year.